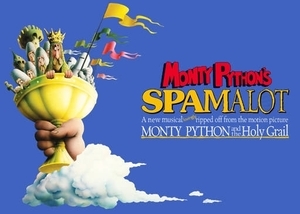 Audiences all around the world have been roaring with laughter since Monty Python’s Spamalot, by Eric Idle and John DuPrez, won the Tony Award for Best Musical in 2005. Spamalot tells the legendary tale of King Arthur and the knights of the Round Table and features a bevy (or possibly a brace) of beautiful show girls, witch burnings (cancelled too expensive) not to mention cows, killer rabbits and French people. The show features the hilarious songs He Is Not Dead Yet, Knights Of The Round Table, Find Your Grail and of course the Nation’s Favourite Comedy Song (Reader’s Digest Poll 2009) – Always Look on the Bright Side of Life. 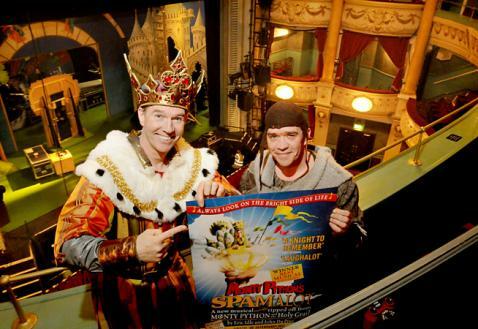 First annoucements that Steven Pacey’s had been cast as King Arthur in the Spamalot regional tour appeared on the Spamalot Twitter Feed and Facebook Page, and on the Musical Theatre Blog on 10 January, 2012. 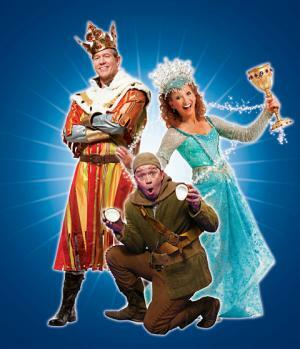 And again, during 2013, between 3 April and 18 May, at the Playhouse Theatre. Sessions were approximately one hour and 30 minutes, with one 20 minute interval, from Monday – Saturday at 7:30pm, with matinees at 2:30pm Wednesday and Saturday. Tickets were £15.00 to £45.00, sold through the Ambassador Theatre Group. 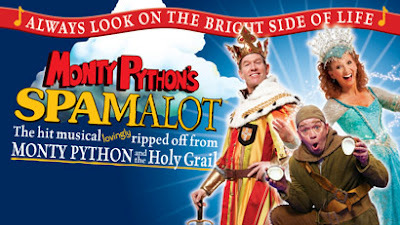 New poster for Spamalot at the Playhouse Theatre. 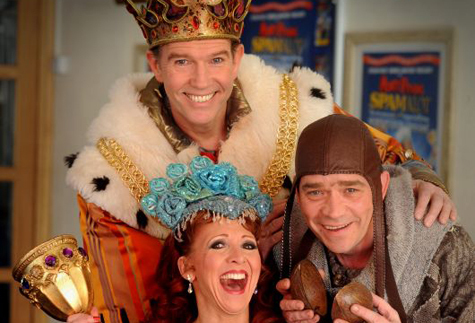 Bonnie Langford, Steven Pacey and Todd Carty in Spamalot. Steven Pacey and Todd Carty. Photograph from The York Press, uncredited. Arthur (Steven Pacey) is a joy to watch, every emotion plays on his face; his singing voice is fantastic and carries well … Pacey’s comic timing was excellent. Steven Pacey … excelling as the straightman to the infectious silliness of both characters and plot. Steven Pacey captures the essence of the King perfectly. Steven Pacey makes for a fine buffoonish King Arthur. His heartfelt number I’m All Alone, despite the entire cast thronging the stage is a hoot. Steven Pacey was glorious as King Arthur, the song, I’m All Alone was a highlight of the show. … if you can catch with Langford and Pacey in the cast, you’re sure of a real treat! Steven Pacey is, perhaps, surprisingly cast as King Arthur; being a ‘proper actor’. His plausible delivery, though, was the perfect antithesis for the bizarre caricatures of the supporting cast. His timing was impeccable, particularly in the quick-fire scene where he meets Dennis Galahad (Jon Robyns) for the first time. Pacey has a strong delivery, his wonderfully befuddled “nice-but-dim” King Arthur a beautifully crafted creation. Steven Pacey’s lead turn as Arthur carries things along with fine voice and comedic touch. 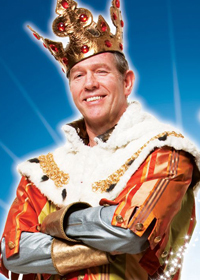 Steven Pacey as King Arthur covers all aspects of the role, commanding at times but mainly chief source of amusement with special mention for the stage fight scenes. Steven Pacey as Arthur has a fine singing voice and stage presence. Steven Pacey sparkles as King Arthur. Steven Pacey (Spooks, Pie in the Sky and Lovejoy) who stars as Arthur, King of the Britons, played the part with panache – with a giant ego and surprisingly good singing voice to boot. Steven Pacey was brilliant as King Arthur. 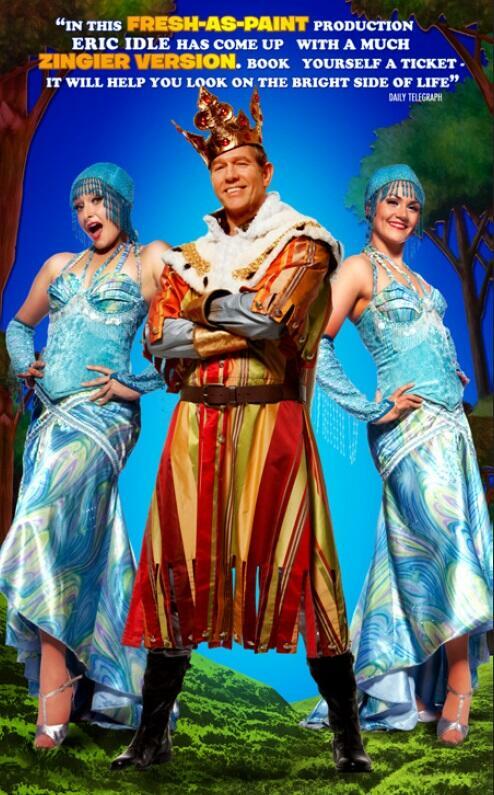 … strong performance from West End veteran Steven Pacey as King Arthur. Steven Pacey … provided the exact dryness, comedy and slight stupidity to the role with which we are all familiar. 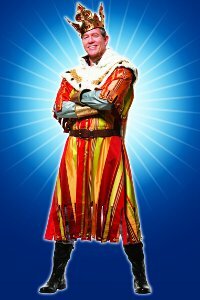 Steven Pacey holds the show together as King Arthur, with a fine voice and the Midas touch of comedy. Steven Pacey is both clown and commander as King Arthur. ALL hail the new king of Spamalot. He has the golden crown, legendary sword Excalibur and even a trusty steed … well, Todd Carty equipped with a couple of coconut shells. Tim Curry, Phill Jupitus, Matthew Kelly, Sanjeev Bhaskar and Marcus Brigstocke have all plonked the backsides on the Spamalot royal throne and now it’s the turn of Leamington’s Steven Pacey. The former Blake’s 7 actor once had the universe at his fingertips in the BBC 1 sci-fi series, but he is now the ruler of all he surveys as King Arthur in Monty Python’s medieval spoof. 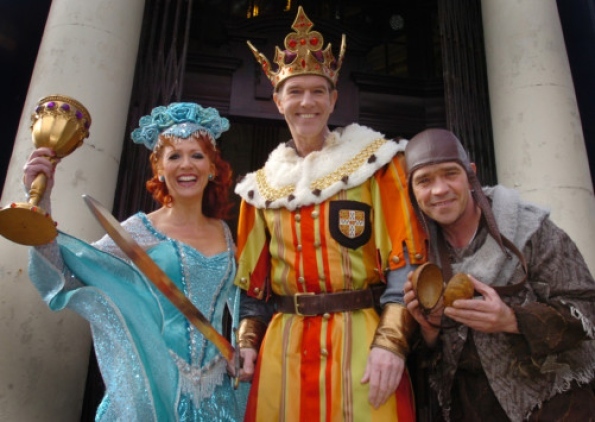 He is touring the country with the hit show which sees Bonnie Langford as the Lady Of The Lake and Todd Carty back as the king’s loyal servant Patsy. So how is Steven coping with knights of the round table, killer rabbits and beautiful show girls? Steven says he laughed out loud when he first read the script for Spamalot and couldn’t wait to put on the crown. “There’s just waves of laughter from the audience during the show. It’s wonderful to hear. I remember seeing Monty Python sketches when I was growing up and thinking the naked man playing the piano was very rude and naughty. How times have changed. 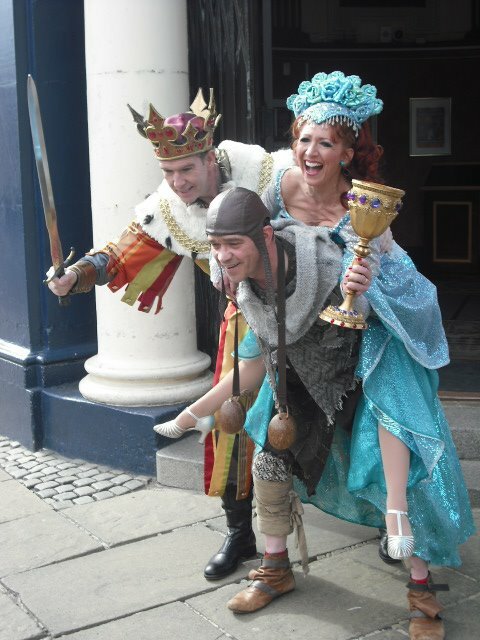 Spamalot has had audiences all around the world roaring with laughter and there have been productions in America, Australia, New Zealand, Japan, Canada and across Europe. Eric Idle, who says he lovingly ripped off Monty Python And The Holy Grail for Spamalot, even makes a special screen appearance and Steven says songs like Always Look On The Bright Side Of Life are always a hit. The Olivier Award-nominated actor has appeared on TV in dramas such as Wallander, Taggart, Doctors, Foyle’s War and Spooks and has recorded more than 300 radio plays and 200 audio books. Steven’s family originally came from Yorkshire and his father was a builder. He jokes that his parents were working their way down the country in search of good weather when they reached Leamington and he was born. “We left when I was a babe in arms and ended up in Brighton, but I now know Coventry and Warwickshire a lot better because my twin daughters Jessica and Laura both went to Warwick University.